Objective: In view of the characteristics of Whole-Body Diffusion-Weighted MRI (WB-DWI) and the difficulties in the diagnosis of bone metastases from lung cancer, our study aimed to explore the possible application of WB-DWI in diagnosis of bone metastases from lung cancer. Methods: 70 patients with lung cancer were selected in our hospital from August 2012 to June 2014. All the patients were subjected to both WB-DWI and bone scintigraphy within one week after admission. Images obtained using those two methods were analysed by two physicians using a double-blind method. Sensitivity, specificity, Positive Predictive Value (PPV), Negative Predictive Value (NPV) and accuracy rate of the two methods were compared. Results: 210 lesions and 83 affected areas were detected by WB-DWI, while 179 lesions and 83 affected areas were detected by bone scintigraphy. Sensitivity, specificity, PPV, NPV and accuracy rate of WBDWI were 90.7%, 96.30%, 97.5%, 86.67% and 92.86%, respectively, and values for bone scintigraphy were 86.05%, 88.89%, 92.5%, 80% and 87.14%, respectively. Those two methods showed similar sensitivity, PPV and NPV. Specificity of WB-DWI was slighter higher than that of bone scintigraphy, but the difference was not statistically significant (McNemar test, p=1). WB-DWI showed significantly better result in ROC curve analysis than that of bone scintigraphy. Conclusion: WB-DWI showed good agreement with bone scintigraphy in diagnosis of bone metastases from lung cancer. WB-DWI avoids the application of radiation, and also showed better result in ROC curve analysis compared bone scintigraphy. So WB-DWI is worth to be popularized in clinical study. Bone metastasis, which can be used as an indicator of the poor prognosis in patients with lung cancer, is the most common type of metastases in lung cancer patients . Clinical studies have shown that the one-year cumulative incidence rate of bone metastasis in lung cancer is as high as 5.9% , and 30-40% of the patients will develop bone metastasis during the whole course of disease . Bone metastasis itself and complications caused by metastatic bone, including vertebral deformity and collapse, pathologic fracture, spinal cord compression, hypercalcemia of malignancy and severe pain can seriously reduce the life quality of patients . A variety of treatments have been developed to treat bone metastasis in lung cancer patients. Systemic chemotherapy is the most common used method, but the clinical application of this therapy is limited by drug tolerance developed during the longterm use of drug [5,6]. Application of other treatment, such as radiation therapy, is also challenged the adverse side effects caused by the treatment . As a result, the median survival time of lung cancer patients with bone metastases is still below 10 months . Therefore, the early diagnosis and treatment is the key in preventing deaths caused by bone metastases from lung cancer. Accurate imaging plays pivotal roles in the diagnosis of various human diseases including bone metastases in lung cancer patients . Bone scintigraphy, as a nuclear scanning test using nuclear medicine, is a highly sensitive diagnostic method for various bone condition, such as bone fractures, bone inflammation, bone cancer and metastasis, and the efficiency was found to be higher than that of traditional X-ray test . However, the clinical application of bone scintigraphy is still facing the adverse side effects caused by the use of nuclear medicine, such as 99mTc with Methylene Diphosphonate (MDP) . In addition, a recent study showed that Computed Tomography (CT) can provide better diagnostic results than that of bone scintigraphy , indicating that bone scintigraphy may not be the best method in diagnosis of this disease. WB-DWI, as a novel imaging technique that combines whole body MRI and Diffusion Weighted Imaging (DWI), has been proved to be a promising tool in detecting and monitoring bone metastases [12-14]. A recent study showed that the sensitivity of whole body MRI in detecting bone metastases from renal cancer is higher than that of bone scintigraphy , indicating that WB-DWI may also be a better method than bone scintigraphy in detecting bone metastases from renal cancer. In this study, WB-DWI and bone scintigraphy were used to detect bone metastases in patients with lung cancer. Sensitivity, specificity, Positive Predictive Value (PPV), Negative Predictive Value (NPV) and accuracy rate of the two methods in diagnosis were compared. 70 patients with lung cancer were selected in our hospital from August 2012 to June 2014. All patients received WB-DWI and bone scintigraphy tests within one week after Bone metastases was found in 43 patients, including 22 males and 21 females. Ages ranged from 28 to 78 y, with an average age of 56.5 y. Patients with contraindications to MRI, such as the patients with pacemakers, metal foreign bodies and claustrophobia were excluded. Patients with other types of cancers other than lung cancer were also not included. This study was approved by the ethics committee of our hospital, and all patients signed the informed consent. WB-DWI was performed on a 1.5 T clinical superconducting MR scanner (signa Excite HD 1.5 T, GE Medical system, Wisconsin, USA) using STIR-DWEPI sequence. Patients were asked to lie down in supine position with free-breathing. Scanning from skull to the upper part of femur was divided into 8 segments. Scanning parameters were: TR 4500 ms, TE 62.4 ms, TI 200 ms, FOV 38 cm × 38 cm, matrix 128 × 128, layer thickness 8 mm, slice gap 0mm and NEX4. The b-value was set to 0 and 800 s/mm2 and the scanning time is about 30 min. After scanning, original images of 8 segments were analysed and processed using ADD/SUB software. Dual-probe SPECT scanner (E.CAM, body-scan, Siemens, Germany) with low-energy and high-resolution collimator was used. Patients were subjected to intravenous injection of 740 MBq (20 mCi) of Tc-99m Methylene Diphosphate (MDP), and whole body scan was performed 2 h later with a speed of 20 cm/min and a scanning time of about 10 min. Final determination of the lesion was based on the initial diagnosis and the follow-up carried out 12 months later. The dynamic changes of lesions during follow-up and treatment, and results of biopsy performed using living tissue collected during surgery were used to prove the existing of lesions. If lesions couldn't be determined using pathological methods, a consultation involving physicians, radiologists, pathologists and surgeons was hold to determine the lesions. Images obtained using two methods were analysed by two physicians using a double-blind method. A 5-point visual scoring system was applied: 1 point, definitely absent; 2 points, probably absent; 3 points, equivocal; 4 points, probably present; 5 points, definitely present. SPSS11.5 statistical software was used to analyse the data. Comparisons of outcomes of those two methods were performed using McNemar's test analysis, and p<0.05 was considered to be statistically significant. Images obtained using two methods were analysed by two physicians (observer) using a double-blind method, and the consistency of image interpretations was tested by Chi-square analysis. Results showed that kappa value of WB-DWI was 0.78, and showed no significant difference from that of bone scintigraphy (0.77). Our data indicate that the images obtained using WB-DWI and bone scintigraphy can provide good consistency in image interpretations (Table 1). Table 1: Comparison of the consistency in image interpretations between two methods. For WB-DWI, the area under ROC curve (Az) was 0.955 (Figure 1A), while Az for bone scintigraphy was 0.927 (Figure 1B). Both WB-DWI and bone scintigraphy showed Az value greater than 0.9, indicating the high accuracies of those two methods in the diagnosis of bone metastases from lung cancer. In addition, Az value of WB-DWI was significantly higher than that of bone scintigraphy. Our data suggest that both WBDWI and bone scintigraphy can be used to accurately diagnose bone metastases from lung cancer, but WB-DWI should be preferred. 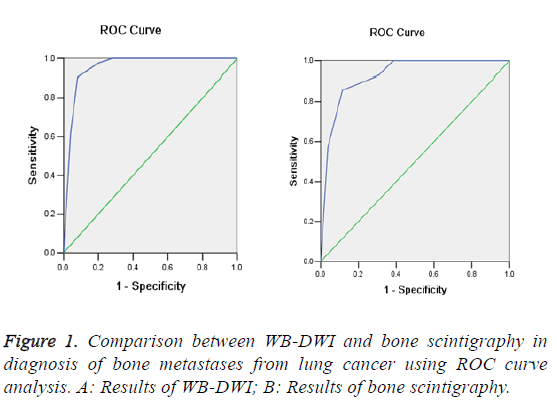 Figure 1: Comparison between WB-DWI and bone scintigraphy in diagnosis of bone metastases from lung cancer using ROC curve analysis. A: Results of WB-DWI; B: Results of bone scintigraphy. Among 70 lung cancer patients, bone metastasis was detected in 43 patients. 40 cases including one false positive case were detected by WB-DWI, while 40 cases including three false positive cases were detected by bone scintigraphy. Sensitivity, specificity, PPV, NPV and accuracy rate were 90.7%, 96.30%, 97.5%, 86.67% and 92.86%, respectively for WB-DWI, and were 86.05%, 88.89%, 92.5%, 80% and 87.14% respectively for bone scintigraphy. WB-DWI showed a specificity slightly higher than that of bone scintigraphy, but the difference was not statistically significant (McNemar test, p=1). Our data suggest that WB-DWI and bone scintigraphy have good consistency in sensitivity, specificity, PPV, NPV and accuracy rate in the diagnosis of bone metastases from lung cancer (Table 2). Table 2: Comparison of sensitivity, specificity, PPV, NPV and accuracy between two methods in diagnosis of bone metastases from lung cancer. Metastatic bone disease, which is also called bone metastases, is a class of diseases caused by the invasion of primary tumor in to bone tissues . Bone metastases is most common for patients with breast cancer, and about 70% of the patients will develop bone metastases during the whole course of disease . For lung cancer, the percentage of patients who will get bone metastases is also as high as 30% . Although various treatments have been developed to treat bone metastases for lung cancer, no satisfactory can be achieved, and the early diagnosis is still the key for treatment. Clinical studies have shown that bone metastases usually has no obvious symptoms at the early stage , therefore diagnosis based on clinical judgement is not an efficient way for early diagnosis, and imaging techniques should be applied. Bone scintigraphy, which depends on the use of radioactive materials (radiotracers), has been widely used in detecting various bone conditions including bone metastases . Radiotracers used in bone scintigraphy can sensitively reflect the physiological changes in the earliest stages by giving off energy in the form of different intensities of gamma rays . A previous study has shown that sensitivity and accuracy of bone scintigraphy in detecting bone metastases from non-small cell lung cancer were as high as 92.5% and 72.5% . In our study, bone scintigraphy was used to detect bone metastases in 43 patients with lung cancer and the sensitivity and accuracy turned out to be 86.05% and 87.14%, indicating that bone scintigraphy is a reliable method in the early diagnosis of bone metastases. In spite of the advantages of bone scintigraphy in detecting bone metastases during early stage, the clinical application of this method is still challenged by the safety issues. Bone scintigraphy generally requires the intake of radioactive materials by injection, inhalation or swallow, which may cause health problems in patients . Therefore, other imaging techniques, including whole-body Positron-Emission Tomography (PET), CT and MRI have been introduced to the diagnosis [20-22]. A previous study has shown that PET can achieve similar specificity but significantly higher sensitivity and accuracy rate than bone scintigraphy . A study based on mining of databases and literature reviews has shown that the sensitivity, specificity, PPV and NPV of PET and MRI are comparable to those of bone scintigraphy but the accuracy rate was significantly higher than bone scintigraphy . Another study even showed that the combined use of PET and CT can achieve a specificity of 100%, which is significantly than bone scintigraphy . In addition, both PET and MRI can avoid the use of radioactive materials, indicating that bone scintigraphy can be replaced in the diagnosis of bone metastases. Taking advantages of both whole body MRI and DWI, WB-DWI has been widely used in clinical practices as an efficient tool in detecting and monitoring bone metastases [12-14]. In our study, the reliabilities of WB-DWI and bone scintigraphy in detecting bone metastases from lung cancer were compared. WB-DWI showed comparable sensitivity, specificity, PPV, NPV and accuracy rate to that of bone scintigraphy. In addition, the performance of WB-DWI in ROS curve analysis is significantly better than that of bone scintigraphy. Our data suggested that WB-DWI should be a preferred method in early diagnosis of bone metastases compared with bone scintigraphy. Image obtain from scans should be interpreted by more than one physicians to increase the accuracy of diagnosis, and the consistency in image interpretations between individual was also an important criteria in evaluating the reliability of a imaging technique. A previous study has shown that the interpretations of MRI images made by one observer is not reliable for the diagnosis of temporomandibular joint disorders due to the individual differences in interpretation , and high consistency between more than one observers is required. In our study, high and comparable consistencies between two observers were achieved in interpreting images from both WBDWI and bone scintigraphy, indicating the high reliability of those two methods. In conclusion, the performances of WB-DWI were comparable to those of bone scintigraphy in the tests of sensitivity, specificity, PPV, NPV and accuracy rate, while WB-DWI showed better outcomes in ROC curve analysis than bone scintigraphy. WB-DWI avoids the use of radioactive materials, which increases the level of safety. Therefore, WB-DWI should be a preferred method in early diagnosis of bone metastases from lung cancer and should be popularized in clinical practices. Torre LA, Siegel RL, Jemal A. Lung cancer statistics/lung cancer and personalized medicine. Springer Int Publ 2016; 1-19. Ulas A, Bilici A, Durnali A. Risk factors for skeletal-related events (SREs) and factors affecting SRE-free survival for nonsmall cell lung cancer patients with bone metastases. Tumor Biol 2016; 37: 1131-1140. Dantonio C, Passaro A, Gori B. Bone and brain metastasis in lung cancer: recent advances in therapeutic strategies. Ther Adv Med Oncol 2014; 6: 101-114. Woodward E, Jagdev S, McParland L, Clark K, Gregory W. Skeletal complications and survival in renal cancer patients with bone metastases. Bone 2011; 48: 160-166. Miller VA, Hirsh V, Cadranel J. Afatinib versus placebo for patients with advanced, metastatic non-small-cell lung cancer after failure of erlotinib, gefitinib, or both, and one or two lines of chemotherapy (LUX-Lung 1): a phase 2b/3 randomised trial. Lancet Oncol 2012; 13: 528-538. Witta SE, Jotte RM, Konduri K. Randomized phase II trial of erlotinib with and without entinostat in patients with advanced non-small-cell lung cancer who progressed on prior chemotherapy. J Clin Oncol 2012; 30: 2248-2255. Ceniceros L, Aristu J, Castanon E, Rolfo C, Legaspi J. Stereotactic body radiotherapy (SBRT) for the treatment of inoperable stage I non-small cell lung cancer patients. Clin Transl Oncol 2016; 18: 259-268. Scagliotti GV, Hirsh V, Siena S. Overall survival improvement in patients with lung cancer and bone metastases treated with denosumab versus zoledronic acid: subgroup analysis from a randomized phase 3 study. J Thorac Oncol 2012; 7: 1823-1829. Qu X, Huang X, Yan W, Wu L, Dai K. A meta-analysis of 18 FDG-PET-CT, 18 FDG-PET, MRI and bone scintigraphy for diagnosis of bone metastases in patients with lung cancer. Eur J Radiol 2012; 81: 1007-1015. Bahk YW. Combined scintigraphic and radiographic diagnosis of bone and joint diseases: including gamma correction interpretation. Springer Sci Bus Media 2012. Zanglis A, Andreopoulos D, Dima M, Baltas G, Baziotis N. Jaw uptake of technetium-99 methylene diphosphonate in patients on biphosphonates: a word of caution. Hell J Nucl Med 2007; 10: 177-180. Wu LM, Gu HY, Zheng J, Xu X, Lin LH. Diagnostic value of whole-body magnetic resonance imaging for bone metastases: a systematic review and meta-analysis. J Magn Reson Imaging 2011; 34: 128-135. Li B, Li Q, Nie W. Diagnostic value of whole-body diffusion-weighted magnetic resonance imaging for detection of primary and metastatic malignancies: a meta-analysis. Eur J Radiol 2014; 83: 338-344. Padhani AR, Makris A, Gall P. Therapy monitoring of skeletal metastases with whole-body diffusion MRI. J Magn Reson Imag 2014; 39: 1049-1078. Sohaib SA, Cook G, Allen SD, Hughes M, Eisen T. Comparison of whole-body MRI and bone scintigraphy in the detection of bone metastases in renal cancer. Br J Radiol 2009; 82: 632-639. Bone metastases: diagnosis and treatment. Springer Sci Bus Med 2012. Kennecke H, Yerushalmi R, Woods R, Cheang MC, Voduc D. Metastatic behavior of breast cancer subtypes. J Clin Oncol 2010; 28: 3271-3277. Haraldsen A, Bluhme H, Rohl L. Single photon emission computed tomography (SPECT) and SPECT/low-dose computerized tomography did not increase sensitivity or specificity compared to planar bone scintigraphy for detection of bone metastases in advanced breast cancer. Clin Physiol Funct Imag 2016; 36: 40-46. Zhang L, Chen L, Xie Q. A comparative study of 18 F-fluorodeoxyglucose positron emission tomography/computed tomography and 99m Tc-MDP whole-body bone scanning for imaging osteolytic bone metastases. BMC Med Imag 2015; 15: 7. Cheran SK, Herndon JE 2nd, Patz EF. Comparison of whole-body FDG-PET to bone scan for detection of bone metastases in patients with a new diagnosis of lung cancer. Lung Cancer 2004; 44: 317-325. Yang HL, Liu T, Wang XM, Xu Y, Deng SM. Diagnosis of bone metastases: a meta-analysis comparing 18 FDG PET, CT, MRI and bone scintigraphy. Eur Radiol 2011; 21: 2604-2617. Fischer BM, Mortensen J, Langer SW, Loft A, Berthelsen AK. A prospective study of PET/CT in initial staging of small-cell lung cancer: comparison with CT, bone scintigraphy and bone marrow analysis. Ann Oncol 2007; 18: 338-345. Widmalm SE, Brooks SL, Sano T. Limitation of the diagnostic value of MR images for diagnosing temporomandibular joint disorders. Dentomaxillofac Radiol 2014.